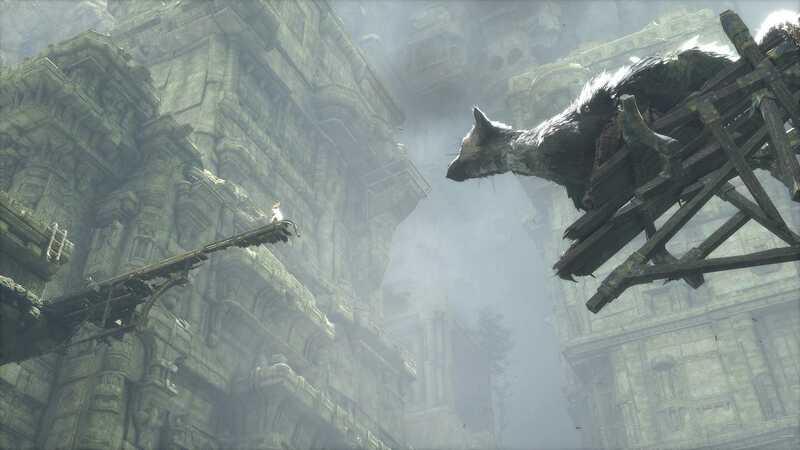 It’s been almost ten years since The Last Guardian was announced via Japanese games publication Famitsu, and ever since, fans of ICO and Shadow of the Colossus have been speculating, hoping and dreaming about the third instalment from visionary director, Fumito Ueda. If you’re one of those people – one of those that wish Ueda was the guy who told you your bedtime stories as a kid and not your father, I doubt you’ll be disappointed with this wonderful tale of friendship, love and adventure. Technically, however, The Last Guardian is a real disappointment; most of the camera angles are terrible, the controls are clunky and Trico’s AI is painful, almost to the point where you’d not think twice about putting down the controller and moving onto something else. You play as a young boy who starts out asleep in a cave, covered in weird markings, with no recollection of how you ended up there. Next to you, a large creature called Trico howls in pain, spears plunged deep into his body and a thick iron chain strapped to his neck, holding him prisoner. After helping him escape, you must flee the caverns and ancient ruins of a lost civilization, solving puzzles and fighting off mysterious stone warriors that want nothing more than take you away. Throughout the entirety of the game, Trico and the boy’s friendship is the most important aspect of the story, and you are invested into their connection. If Trico gets wounded, you can jump onto him and pull out a spear which helps to ease his pain. You can also stroke Trico to calm him down and help him after a particularly stressful or dangerous situation. You both care greatly for each other, and as the game nears its emotional conclusion it becomes apparent just how much. Like the other Ueda titles, dialogue is made up, and the subtitles are spoken in an uncommon tongue. The voice is of an older man – of the boy as an adult and it gives the story an archaic quality associated with the kinds of tales you heard in history lessons as a child. You can communicate with Trico, offering a few worded commands which will make him move in a specific direction, jump, shove, grab or dive, depending on the circumstances. They are very simple commands, but can take so long for him to undertake due to really bad AI, and unfortunately, this is only the start of the problems. Some of the world requires Trico to jump up numerous platforms, and getting him to do so can take far too long. You may see the spot you need to reach, but he can spend a stupid amount of time ignoring you for no apparent reason. In other parts you’ll need to feed him these glowing barrels, which requires you to pick them up and place them near him or throw them in his mouth. No joke, I spent fifteen minutes putting two barrels next to his mouth, only for him to keep attempting to grab them and miss every time. They were practically touching his mouth, yet for some bizarre reason he couldn’t grab them, and in the end I had to physically stand with them in my hand until he stole them from my grip. 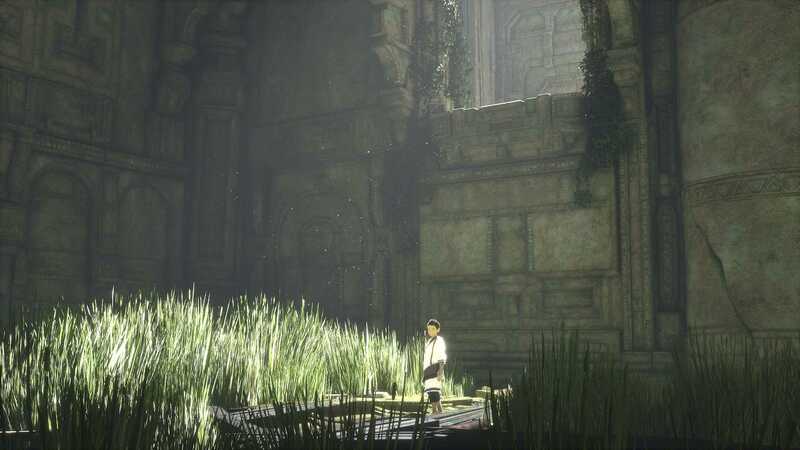 Some of the camera angles are abhorrent; I lost count of the times they zoomed right up Trico’s arse and saw nothing but feathers, or disappeared behind a wall only to see nothing but dark grey stone. Looking around is slow and can be too sensitive. Say I wanted to look up for a way out of a cave, the camera would take two to three times longer than it would in any other game, and when I reached a view I was happy with, the camera would move past it for no reason. It never stops being this bad, but you somehow get used to it, which I guess is somewhat of a mixed blessing. My last major problem with The Last Guardian is the control system. Climbing off and on Trico is awkward, and with the camera moving around on its own accord, it becomes a very frustrating task. Jumping and pulling levers can be tricky when you’re required to rush, and it almost feels as though you’re playing PlayStation One-era Tomb Raider on a PS4. Movement feels slow, and trying to combine all of the mechanics for a puzzle can result in some really painful ‘pull out all your hair and punch a wall’ moments. If you are spending quite a lot of time on a particular puzzle, the narrator will give you a clue, but these can pop up long after you’ve lost your temper trying to solve them. There’s a lot of pulling levers to open gates, and ascending towers to progress, and three quarters in it begins to feel tiresome, padding out a story that has run out of ideas long before. Visually, the game can be glorious, especially when overlooking the crumbling city and its sun-kissed towers, glistening water pools and ruins draped in rich green plant life. It’s a real treat watching some of the more tense moments as Trico runs across breaking bridges and climbs collapsing structures. Some of the finer details do look weak compared to many current gen titles, such as when the boy climbs through Trico’s oddly textured feathers, and it feels like genDESIGN haven’t worked on an upgrade to the cancelled PS3 version. Although it does have significant issues when playing, there’s just something truly unique about it. Trico is a sweet, loyal and loveable creature you’ll develop a fervent bond with, and the environments are interesting – full of unique details and surprises. 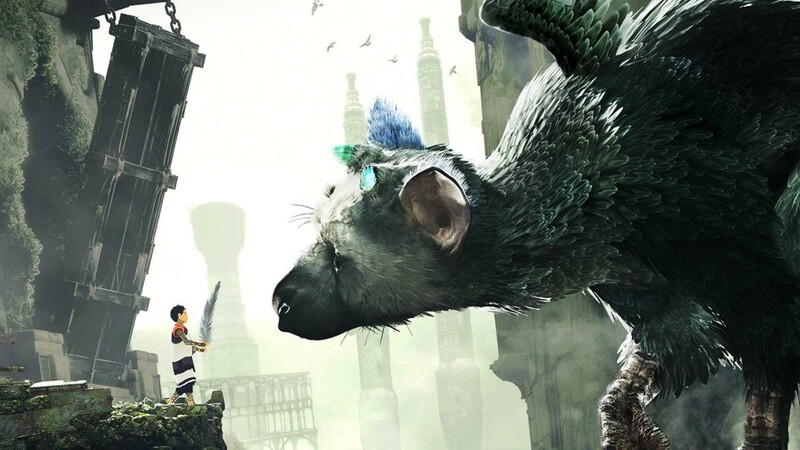 Nine years on and The Last Guardian is here, but its long awaited arrival isn’t quite the revelation we all hoped it would be. 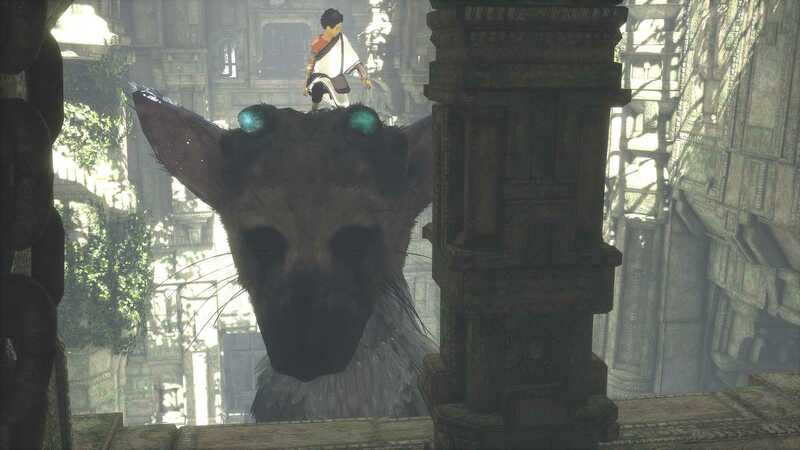 The world is stunning, the bond between the boy and Trico is a beautiful example of love and friendship, and the story is gripping, it’s just a shame there are so many technical issues holding it back.